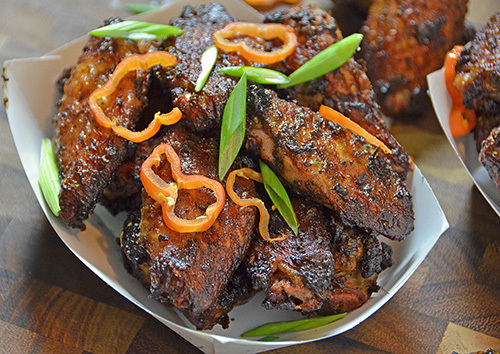 I made some Jerk Chicken Wings this week. The flavor of jerk chicken makes me weak in the knees. Like Cajun food, some mistakenly thick of jerk food as just "hot." Instead, it is highly seasoned. That powerful blending of earthy, spicy, sweet, acidic, and smoky tastes are a wild party on the palate. The Jamison's refer to it as an "assertive combination" in their highly regarded book Smoke and Spice. Jerk food is typically seasoned with seasonings like allspice, nutmeg, cinnamon, thyme, onion, and Scotch bonnet chiles. This seasoning can either be a dry seasoning or a wet paste/marinade. Pork and chicken are used most often. 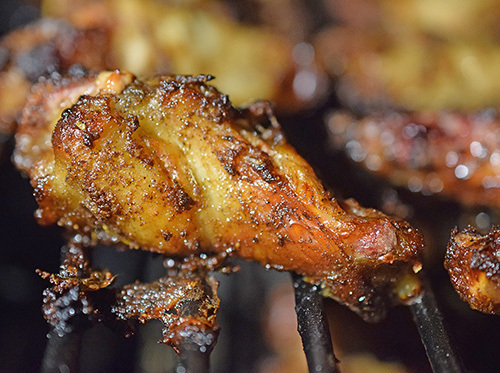 A favorite commercial jerk marinade that can be found in stores is Walkerswood Jerk Seasoning. The marinade recipe that I have used and loved for years is Jamaican Jerk Chicken from the book Sugar Reef Caribbean Cooking [Amazon Affiliate link] by Devra Dedeaux. 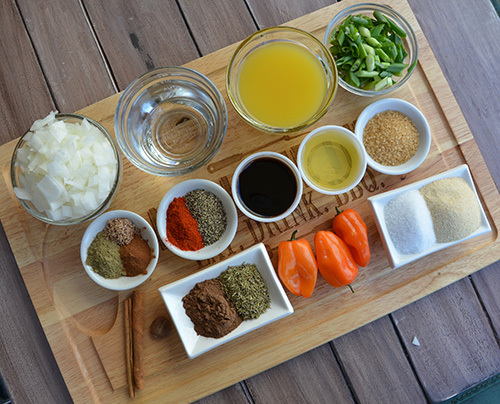 I use the marinade recipe as written in the link above except for a few alterations. I use turbinado sugar instead of white sugar. I use habanero instead of Scotch bonnet chiles because they are more readily available. But when I can get the Scotch bonnets, I use them. 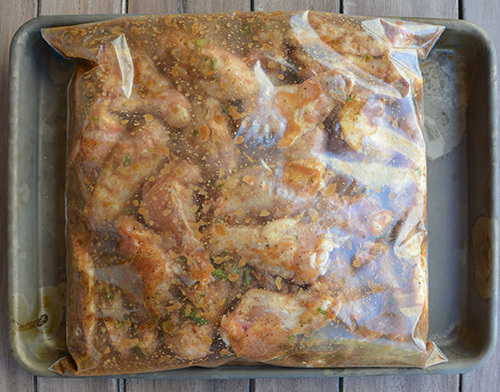 I like to let the wings marinate for 6-8 hours to pack in the flavor. I use a zip-top bag and flip it every 2 hours. I also put it on a small sheet pan because I don't completely trust zip-top bags full of marinating chicken in the fridge. I've had them leak and.....just ewww. 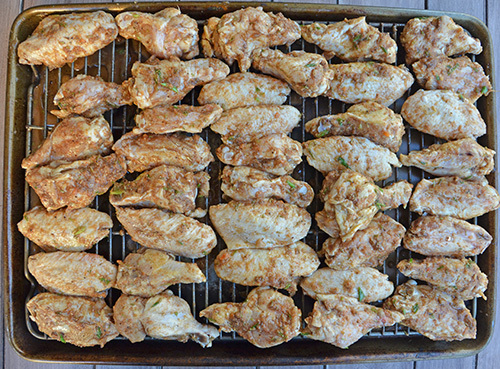 The downside to marinating is that moisture is the enemy of browning and crispy chicken skin. So after marinating, I shook off the excess marinade and put the chicken back into the fridge to air dry for an hour. 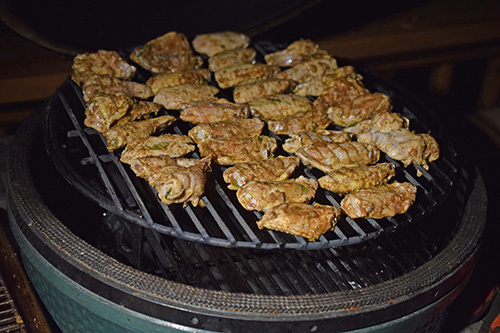 Jerk meats are often grilled on barrel pits over pimento wood [Amazon Affiliate link]. I had neither a barrel pit nor pimento wood, so I just fire roasted mine on a kamado grill burning lump charcoal. My indirect set up was using an Adjustable Rig using the top rack and with a spider & stone as the heat deflector. You could also use a plate setter/Conveggtor legs up with a stock grate. I fire roasted (indirect, higher temp) the wings at 400°f for about 40 minutes. 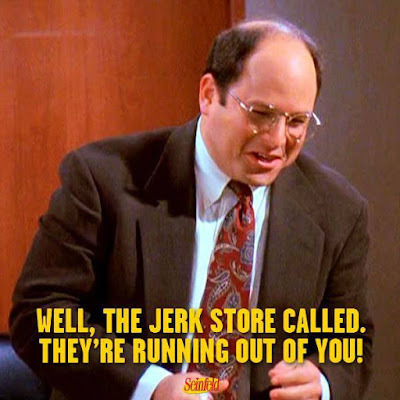 I am an unapologetic teller of "dad jokes" and say this at least once every time that I am roasting jerk chicken. 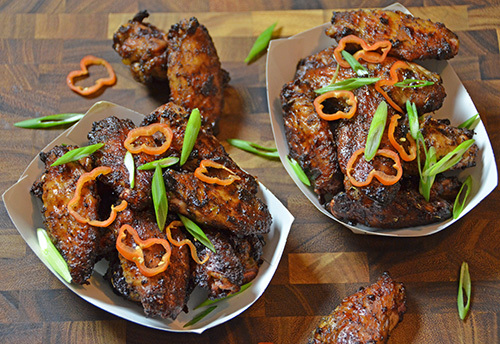 I made these wings for the Carolina vs. Duke game. Sadly, my Tarheels lost, but the wings were definitely a winner. I'll be making these again with the conference and NCAA tournaments coming up.